What is Fast and Free by Aprons Etc.? Aprons Etc. has developed its new Fast and Free product line to satisfy several important and growing demands from our distributor partners...quick in-hands customer delivery time without costly freight/shipping fees. Through principles of Lean Manufacturing (J.I.T), new streamline production methods provide better delivery schedules, lower costs and improved product quality. 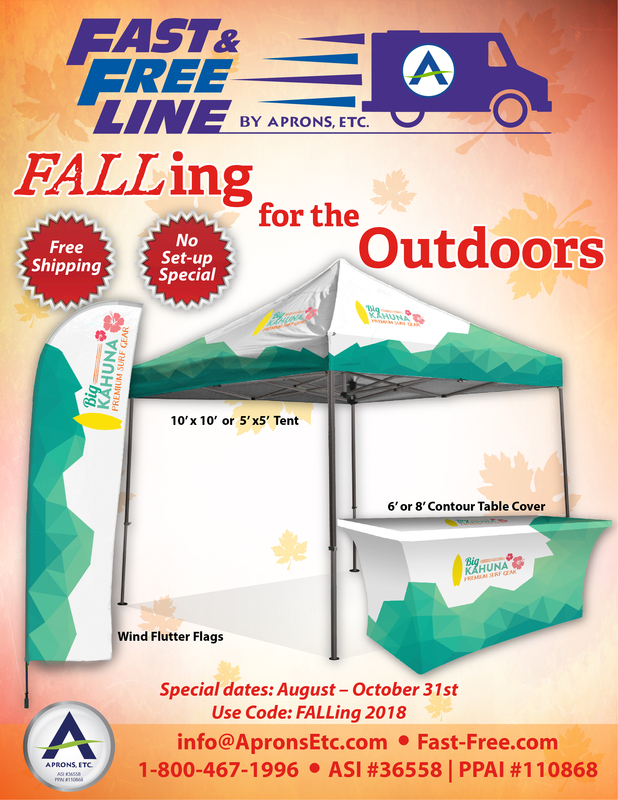 For Products in the Fast & Free line, you'll know when your order will arrive, the total billing costs (including FREE shipping) with a high quality event display item to your customer! FAST - (5) business days IN-HANDS from ordering to customer delivery! Shipping to one location anywhere in the U.S. or Canada.